Leon Trotsky was a leader of the Russian October Revolution, second in command to Lenin. During the 1920s he opposed the policies of Stalin. As a consequence, he was deported and eventually assassinated. When historian David King visited Moscow in 1970, he discovered that the Soviets had made a systematic attempt to purge all mention of Trotsky -- as well as any other person who had fallen out of political favor -- from historical records. 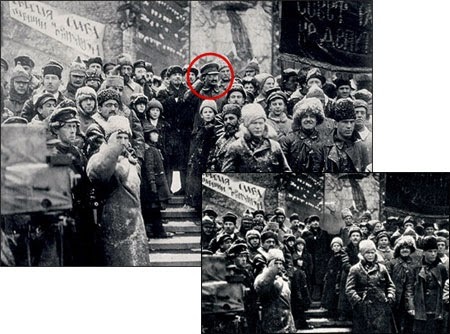 This included removing Trotsky's image from photographs. Comrades! The spirit of Uncle Joe lives on in the dacha of Amherst, NY. That's the home of Prometheus Books, which on February 11 is scheduled to publish my father's autobiography. Ray Hyman, Paul Kurtz, James Randi, and Ken Frazier, July 2010, Las Vegas, after their session on the history of the modern skeptical movement (source). Prometheus was founded by Paul Kurtz, who, according to his lengthy October 23, 2012 New York Times obituary, was "a philosopher whose advocacy of reason ahead of faith helped define contemporary secular humanism...Professor Kurtz founded the Center for Inquiry, which promotes evidence-based reasoning and opposes organized religion, and the Committee for the Scientific Investigation of Claims of the Paranormal (known as Csicop), which is dedicated to debunking pseudosciences." Just a little more than a year after his death, the company founded by this prominent advocate of reason and intellect is publishing the memoirs of Henry J. Heimlich, arguably one of the late 20th century's Masters of Woo. 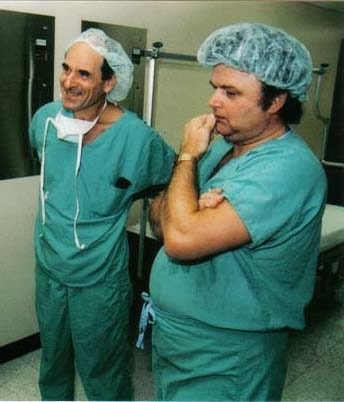 A celebrity doctor who built the first part of his career by falsely claiming to have invented a surgical procedure, my father was fired from his last hospital gig in 1977 and never again had a practice. For decades, his Heimlich Institute funded and supervised violative "research" in which US and foreign nationals were infected with malaria, resulting in investigations by the CDC, the FDA, the Dept. of Justice, and UCLA. And in order to promote his baseless claims that "the Heimlich" was effective to revive near-drowning victims, he reportedly published faked case reports. The result? Dozens of poor outcome cases, including kids. Not far out enough for you, comrades? If Dr. Kurtz knew his imprint would be on my father's book, you know what I think he'd do? Which is exactly what my father's book has done with Edward A. Patrick MD PhD, his closest career colleague. Much of Edward A Patrick’s life is shrouded in mystery, his actual accomplishments clouded by his tendency to bend and invent the facts of his life. 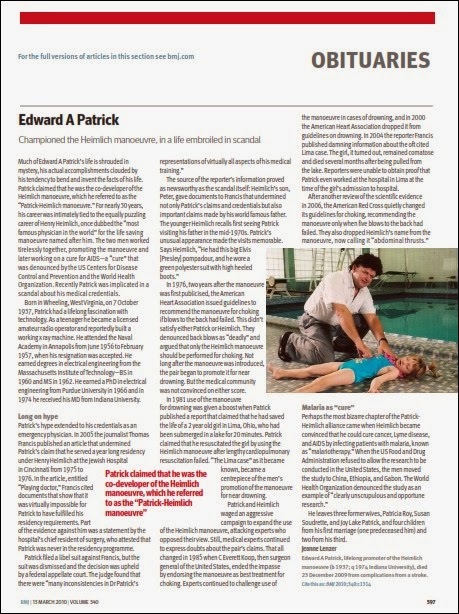 Patrick claimed that he was the co-developer of the Heimlich manoeuvre, which he referred to as the “Patrick-Heimlich manoeuvre.” For nearly 30 years, his career was intimately tied to the equally puzzling career of Henry Heimlich, once dubbed the “most famous physician in the world” for the life saving manoeuvre named after him. The two men worked tirelessly together, promoting the manoeuvre and later working on a cure for AIDS—a “cure” that was denounced by the US Centers for Disease Control and Prevention and the World Health Organization. Yesterday, as the U.S. surgeon general, Koop endorsed the life-saving Heimlich Maneuver "as the only method that should be used for the treatment of choking from foreign body airway obstruction" and prodded the American Red Cross and American Heart Association to move more quickly in adopting it exclusively. ...Koop said in an interview that he felt the need to act more quickly after receiving letters from (Dr. Henry) Heimlich and University of Cincinnati professor Edward A. Patrick, as well as his knowledge of the value of the procedure. "I felt that I couldn't stand around and wait." Patrick, who has performed research showing that the back slap can drive a foreign object downward, complained to Koop that the "lives of many Americans are endangered as the result of Red Cross first aid instruction" and said "it is urgent that you inform the public through the media of the back slap danger." From Using the Heimlich Maneuver to Save Near Drowning Victims by Henry J. Heimlich MD and Edward A. Patrick, MD PhD, Postgraduate Medicine, August, 1988. 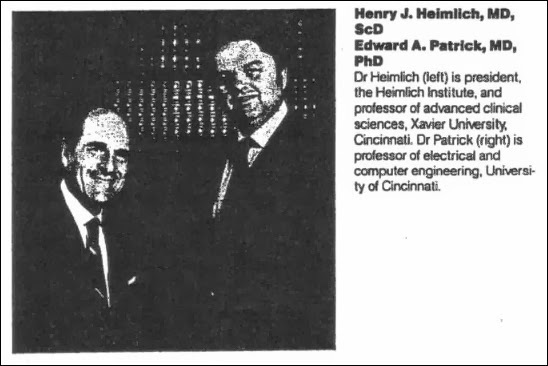 Per a 1994 30-page report, Dr. Patrick partnered with my father to present their arguments for the Heimlich for drowning to a committee convened by the Institute of Medicine. "I would like to get proper credit for what I've done," Patrick told me. "But I'm not hyper about it." Patrick's ex-wife Joy tells a different story: "Whenever my kids would say 'Heimlich maneuver,' he would correct them and say, 'Patrick maneuver.'" Now pour yourself some tea from the samovar and get ready for some major собачья чушь. 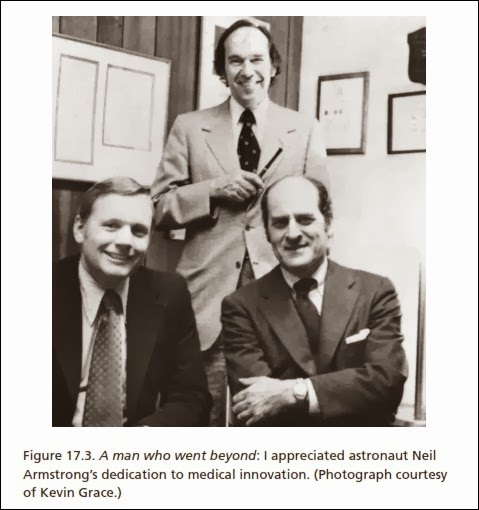 During his tenure with the University, (astronaut Neil) Armstrong took on a project with a number of local medical professionals including Dr. (Henry) Heimlich, Dr. (George) Rieveschl and Dr. (Edward) Patrick. The HARP Group as they were called set out to design an artificial oxygenator for the treatment of chronic lung diseases. Pumps used in heart-lung machines at the time caused severe hemolysis or rupturing of red blood cells and were often unsafe to use for more than a few hours. 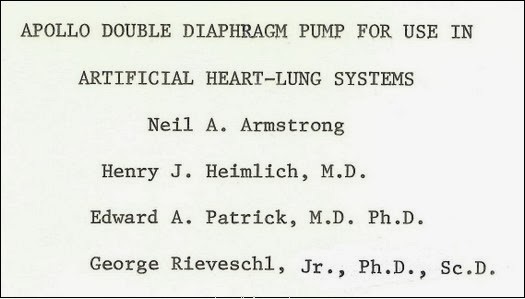 The result of the HARP Group’s efforts was the Apollo Double Diaphragm Pump for artificial heart-lung systems, a modified version of a pump used by NASA to circulate temperature regulating fluid in space suits. My father told me he came up with the name HARP, an acronym made of the first initials of the last names of the four scientists. About a week ago I asked Lisa at Prometheus if the photo was going to be in my father's book. By cropping Dr. Patrick out of the photo, it would appear that, in his revisionist history, Commissar Heimlich has re-named the group HAR. I wanted to find out who censored it, so I called Kevin Grace, whose name is in the cutline. A senior librarian and archivist at the University of Cincinnati, he told me he wouldn't have provided a cropped version of the photo. 1) Is Prometheus responsible for cropping Dr. Patrick out of the photo? If not, who was? 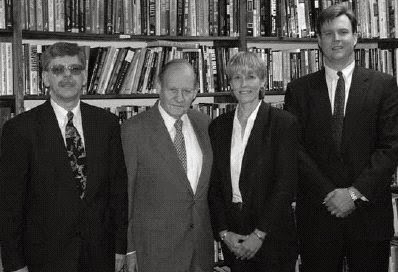 2) Before today, was Prometheus aware that the photo in my father's book had cropped out Dr. Patrick? If so, approximately when did Prometheus become aware of the fact? 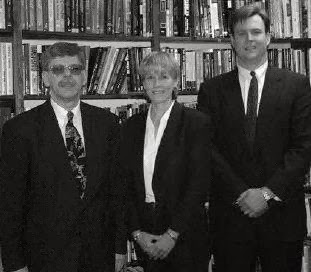 3) In the cut line of the cropped photo that's going to be in the book, is there a reason why Dr. Rieveschl isn't identified? 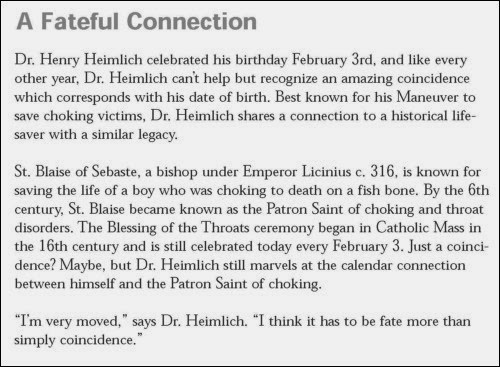 I realize you have a personal interest in this book, an ongoing investigation into the details of your father’s career, and maintain a blog relevant to both, but unfortunately, our staff does not have the time or resources to respond to your detailed queries about the content of Heimlich’s Maneuvers or the steps taken to produce it. For example, tracking down the chronology by which any one interior photo was cropped and captioned is not a quick question but requires several different departments to confer, research, and take time away from their deadline-oriented agenda. The book is finished, printed, and will be in the marketplace in a few weeks. If you have further questions about the book and its contents, you should take them to Henry Heimlich or Janet Heimlich. Let it never be said that I would ever knowingly interfere with anyone's deadline-oriented agenda, but why refer me to my sister Janet, whose book, Breaking Their Will, was published by Prometheus a couple years ago? Based on Ms. Maxick's suggestion, I'll follow-up and try to find out who was responsible for cropping Dr. Patrick out of the photo. Based on the publication of my father's book, the company's editorial policies are apparently no longer bound by Dr. Kurtz's reactionary philosophy of "reason," "intellect," "skeptical inquiry," and "debunking pseudoscience." In that spirit, comrades, let us put the past behind us as we move forward to a brighter and more deadline-oriented future!